Patricia Barkaskas – begins at 27 min mark. Truth Before Reconciliation, Pt 1. Recorded live on Friday, March 10, 2017 from Unceded Coast Salish Territory / Vancouver. While much academic and public discourse since the release of the Truth and Reconciliation (TRC) final report has and continues to emphasize reconciliation, there is also deep skepticism about a process of reconciling that so readily glosses over truth-telling. Centering the truth as it relates to the TRC is essential to any meaningful process of reconciliation in Canada. On today’s show we feature an extraordinary talk by Patricia Barkaskas at a Forum held by the Simon Fraser Institute for the Humanities – March 10th. Patricia Barkaskas earned a M.A. in History, with a focus on Indigenous histories in North America, and a J.D., with a Law and Social Justice Specialization, from the University of British Columbia. She is the Academic Director of the Indigenous Community Legal Clinic and an Instructor at the Peter A. Allard School of Law. Patricia has practiced in the areas of child protection (as parent’s counsel), civil, criminal, family, and prison law. She has worked closely with Indigenous peoples in their encounters with the justice system and worked for Residential school survivors as an historical legal researcher for the Indian Residential Schools Settlement Agreement. In addition, she has written Gladue reports for all levels of court in BC. 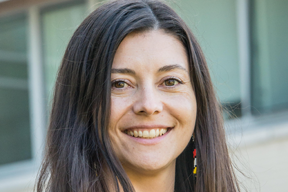 Her current and future teaching and research interests include access to justice, clinical legal education, decolonizing and Indigenizing law – particularly examining the value of Indigenous pedagogies in experiential and clinical learning for legal education – and Indigenous laws. Patricia is Métis from Alberta. Part 2 with Dr Sarah Hunt will be aired Wednesday March 14th.